When you set constraints in a project plan, you essentially set time restrictions. Constraints put project phases within a specific time frame and can be set for milestones, activities and summary activities. Constraints on planning elements limit the flexibility of the project plan: the project planner or project manager cannot move planning elements along the timeline freely but need to plan within the timely constraints. Learn more about constraints here. Before you set constraints, you should have established dependencies between your planning elements. Double-click the planning element you want to edit or click on the planning element once and then on Edit in the Ribbon. Now you can edit the planning element in the side panel on the right. In the section Time Frame you have the field Constraint where you can now set the restriction for this planning element. Select the type of constraint you want to set (e.g. Start on a certain date) and select the date and time in the calendar. The different types of constraints are explained here. In contrast to activities, milestones do not have a duration; nevertheless, you can constrain a milestone’s start or end date and/or time. This is done the same way as with activities. You can set different kinds of constraints on planning activities. Start as soon as possible – Choose Start and click on As soon as possible. If you set this type of constraint, this planning element is set to start as soon as its predecessor is finished. This allows for maximum flexibility in your project plan. Start is on a specific date – If your planning element is supposed to start (activity) or happen (milestone) on a specific date, select Start and On. Then choose the date and time for the start of the planning activity. The activity will have to be started on this specific date, otherwise, you will be alerted to a constraint violation as you will see this symbol in your Gantt-chart. 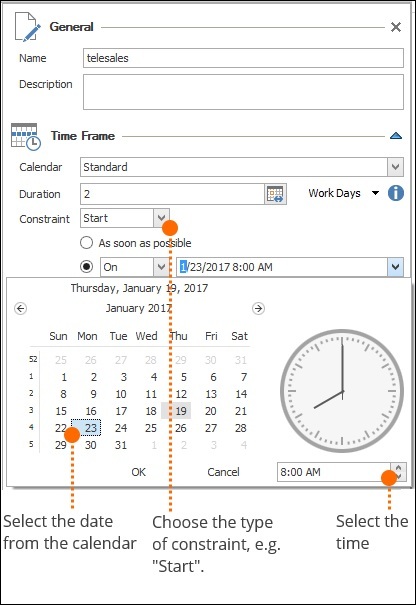 Planning element must not start before a certain date – If you set this type of constraint, the planning element may only start on or after a certain date. Select Start and No earlier than. Then select the start date and time from the calendar. The planning element can be delayed into the future, but may not be moved up earlier along the time line. 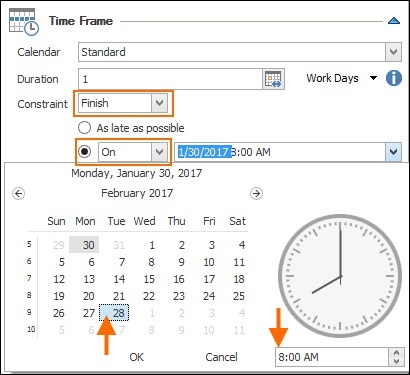 Planning element must start no later than on a certain date – This type of constraint is useful, if a planning element must start before a certain date. The planning element then needs to start on this date at the latest. Select Start and No later than and then choose the date and time from the calendar. End date is as late as possible – Select Finish and click on As late as possible. This constraint is set when the latest possible end date for completion should be calculated from the end date of the whole project. Planning element must be completed on a specific date – If a planning element needs to be finished on a specific date, select Finish and On. 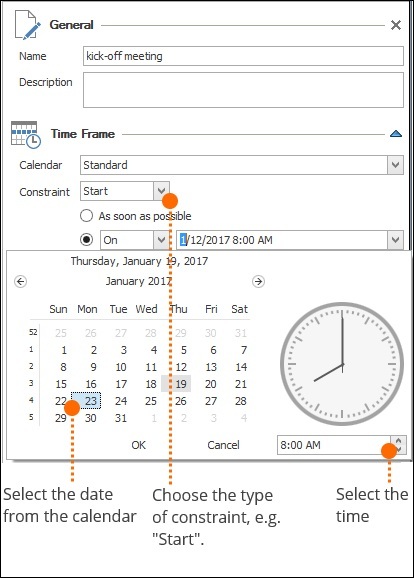 Then select the date and time from the calendar. This planning element may not be moved along the timeline and must not end earlier or later than on the set date. Planning element must not be completed before a certain date – If you set this constraint, this planning element may be finished on or later than the set date. It must not be completed sooner, though. 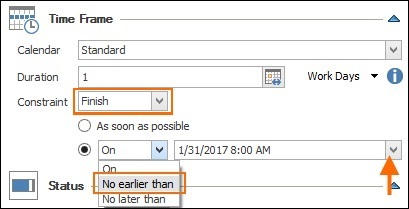 Select Finish and Not earlier than and then select the earliest possible date and time from the calendar. Planning element must be completed on a specific date at the latest – With this type of constraint, the planning element must be completed as soon as possible but no later than on the set date. Its completion must not be delayed at all. Select Finish and No later than, then choose the latest possible date and time for the completion from the calendar. HINWEIS Constraints on single planning elements influence the whole project plan. It may be that you are not able to move planning elements freely along the timeline, due to constraints set on planning elements. 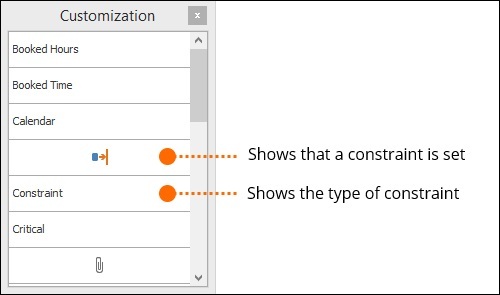 If this is the case, InLoox alerts you to possible constraint violations with the symbol “constraint violation” in the planning list next to those planning elements that are affected. TIPP For better overview, it is advisable to show the field Constraint and/or the field with the symbol in the planning list. Clicking on the undo-symbol in the tool bar, if you want to remove the constraint you have just created. By clicking on the planning element the constraint of which you want to remove and then clicking on Remove Constraint in the ribbon in the tab Edit. Alternatively, you can also use the short cut CTRL+ALT+R. Set constraints | InLoox 9 for Outlook • Copyright 1999-2019 © InLoox, Inc. All rights reserved.